It's the time of year to start thinking about getting out of the Snow and Cold, and playing golf in Florida - SUNSHINE AND WARMTH. I will try and break down our destinations individually, and give suggestions on where to go. By far, Orlando is one of Golf Zoo's top destination in the Winter. A couple of the reasons for this are lodging and quality golf. The most reasonable lodging choices area Villa's, Condo's and Homes. These are all very inexpensive, and you can have it so each guy has his own room. Most all these properties are located in the SW Orlando, within 30 minutes of all the top courses. As far as the golf - there are at least 30 courses in the area that are all rated 4 - 4 1/2 stars by Golf Digest and all ranked high in the state. Most guys that come in on golf packages from the North; love to get as much golf in as possible, during their stay. Orlando definitely can handle the multiple day rounds for the guys. There are 8 multiple course facilities in the area and all very good. Winter packages for Orlando as the rest of Florida are considered peak season. Golf can range from $75 a round to $175, and some of the lower priced courses are as good as the higher priced ones - discuss this with you Golf Vacation Specialist. I will break down the other popular areas of Florida and offer advice and insight. This area is 70 miles SW of Orlando and located on the Gulf of Mexico. This area has numerous courses, that include 5 multiple course facilities. One of the things about Tampa, is that driving to courses may take some time - due to the fact that they are spread out. Some of the best facilities in the area are anywhere from 30 to 60 minutes from Tampa. There are some lodging choices that offer villa's, but most of the choices will be hotel rooms. A lot of guys going on these golf trips, like to have some nightlife options, especially adult entertainment. Tampa has some of the best adult entertainment in the state. This area is located in the NE part of the state. During the winter months, Jacksonville can be a little cooler than the rest of the state - but still a lot warmer than the NE United States. Jacksonville has 4 major resort type properties, all offering multiple courses and multiple lodging choices. These all are very good, but can be a little pricey. There are probably another 10 - 12 good public courses in the area. Jacksonville's other lodging, not resorts will be hotel rooms. The area is also located on the ocean. The pace in Jacksonville is a little slower than the other areas and a little more laid back. This area is located 45 minutes north of W. Palm and about 90 minutes SE of Orlando. There are not a lot of courses in the area, about a half dozen. One facility they have is PGA Village - lodging and 54 holes on site. This is a very nice facility. This is more a golf only type trip, not a lot of nightlife in the area - but very good golf. Closest airport is 45 minutes away, in W. Palm Beach. I put these two areas together, because they are basically 30 - 45 minutes apart. The lodging in these areas will mainly be hotels. Of the two areas, Ft. Lauderdale has more golf courses to choose from. There are 4 multiple course facilities Ft. Lauderdale area and 2 in the Miami area. One of the most famous multiple course facilities in Miami, is Doral Resort and Spa. The resort has 5 golf courses on site. The stay and play packages are not cheap, but it's a nice resort. There are only another 4- 6 courses in the Miami area. Getting around in South Florida can be tough, a lot of traffic. I don't consider South Florida on of the top destinations in the state, for a couple of reasons - not a lot of course choices, especially quality and more expensive than what you pay for. The weather in South Florida can be warmer than the rest of the state. There is great night life in both Ft. Lauderdale and Miami (South Beach). 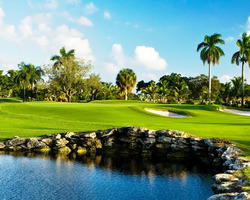 If you want to be able to play good golf, enjoy the nightlife and spend more money - then South Florida is a good choice. Palm Beach area is very nice and upscale. There are only a few top public courses in the area. The main draw is PGA Resort and Spa. This is a very nice resort and you have to stay there in order to play there. There are 5 courses on site - 2 of the courses are very good, the other 3 are average. If you want to be able to go somewhere and enjoy a resort and have all the golf - this is a good choice. Keep in mind, it is again not cheap. This area is located about 2 hours south of Tampa. This is located on the West Coast and has very nice weather. Majority of lodging choices are resorts and hotels, not very many condos or villas. The golf in this area, especially Naples - is very good and quite expensive. The Naples area is also know as Gods waiting room. You will enjoy going here for nice lodging a very good golf - again, you will pay top $$$ for these packages. I hope this brief synopsis offers some insight on putting together a golf package in Florida, during the winter months. Your best bet is to discuss this with your golf vacation specialist (www.golfzoo.com). 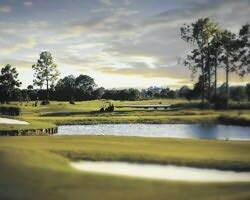 We just don't live here in Florida, we have been to the resorts or played most all the courses we sell. The best thing about using a golf package company to plan your trip is ease of planning. We do everything for you - your group just comes down and enjoy. Check out our website - www.golfzoo.com, and all the hot deals we have for the winter months. Feel free to call me anytime - 888.333.6103 to discuss your needs.